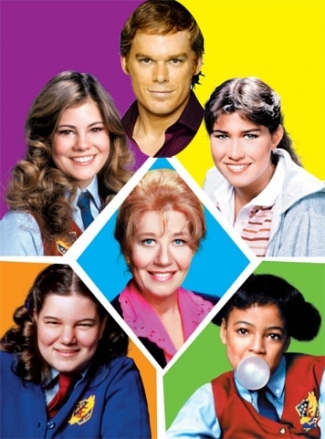 How is ‘Dexter’ Like ‘The Facts of Life’? I’m not saying last night’s Dexter storyline was a little bit ridiculous or anything, but, remember that episode of The Facts of Life where Blair was dating that dude who cheated on her (season 4, “Magnificent Obsession,” and no, not ashamed that I know that), and her friends couldn’t believe snooty Blair would allow herself to be treated that way by any guy? But she did, and when Mean Boy asked her to go away on a ski trip with him, the other girls didn’t want her to go, so they stayed up all night to keep her away from the dorm pay phone (pay phone … I know!) so she wouldn’t call him and tell him she would go and he would ski off without her? Last night’s Dexter, and Deb’s plan to have nightly sleepovers with her brother to help him cure his serial killerness? The Facts of Dexter’s Life. And that other serial killer, who spouted wise to Dexter and actually had him briefly believing he might be able to change, before Other Serial Killer walked into a semi? He’s the Mrs. Garrett of this scenario. 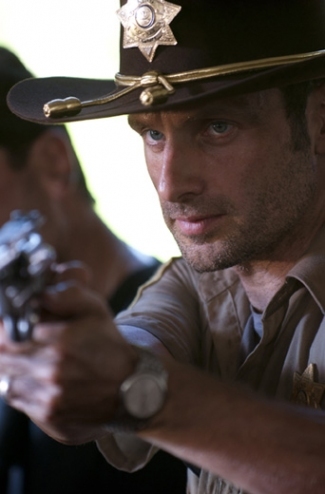 The Walking Dead – So. Good. We’ve waited quite a while for the follow up to those first six episodes, and the show doesn’t lose a step with the season two premiere, full of tension, drama, thrills, gore, the continuing love triangle and one of the grossest, by which I mean cool, scenes you will ever see on TV (you’ll know which one I’m talking about when you see it). 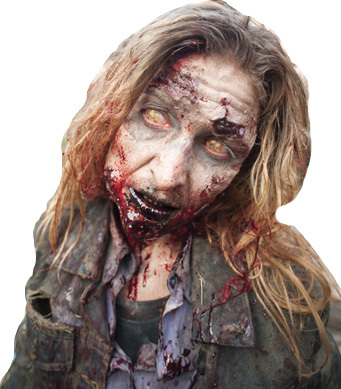 Also not to be missed: the premiere of Talking Dead (11:59 p.m.), the new Chris Hardwick-hosted aftershow that will air each week after the new Walking Dead eps, and Walking Dead A to Z, the alphabetical guide to all things Dead I wrote this week at TheWrap.com. Saturday Night Live – What’s Your Number? star Anna Faris hosts, and Degrassi alum/rapper Drake makes his first appearance as musical guest. iGenius: How Steve Jobs Changed the World – MythBusters hosts Adam Savage and Jamie Hyneman host this special that pays homage to the many innovations of the late Apple co-founder and how they have impacted the world. Desperate Housewives – Lynette thinks Tom may be dating, and Bree thinks Danielle’s new business may not be as wholesome as she’s hoped. The Good Wife – Alicia volunteers for a case, but one of her witnesses turns out to be the prime suspect. TV Guide: 100 Moments That Changed TV, Part 4 – The Real World and The Simpsons episodes are among the shows that provided seminal TV moments in this penultimate installment of the TV Guide miniseries. Chopped – A special Halloween-themed episode finds candy, chicken feet and some, ahem, unusual meats, in the mystery baskets. Homeland – Carrie and her team investigate a potential Al Qaeda attach on American soil. Real Housewives of New Jersey Reunion, Part 1 – Finally. After three seasons of watching Teresa act like a creep, the women call her on her nonsense. The Teresa vs. Caroline showdown: not to be missed. Dirty Soap – Galen and Jenna argue about having another baby, while Nadia and Brandon attend Fashion Week in New York, where he walks in one of the shows. – Ray worries his new client may be his old student on Hung (Sun., 10PM, HBO). – The Dexter season four finale earned the show its best ratings ever (up a whopping 71 percent versus the season three finale), but season five will carry on without longtime Dexter showrunner Clyde Phillips, who quit the show to spend more time with his family. – More good ratings news: It’s Always Sunny in Philadelphia‘s fifth season, which wrapped last Thursday, was the show’s highest-rated season ever. – The New York Times has scoop on the ninth season of The Biggest Loser, which premieres on NBC on Jan. 5 and will include the first contestant who’ll start the show weighing more than 500 pounds. – Could self-adhesive gift wrap (SUCH a good idea!) be the next big product from the company that gave us the As Seen on TV classic, the PedEgg? – Tough Love mother-and-son matchmakers JoAnn and Steven Ward are starring in a VH1 spin-off series, where they’ll put couples who are about to get engaged through a boot camp to see if they’re really right for each other. – Side effect of the recession: Not surprisingly, more people are staying home and watching TV. – Nickelodeon has ordered 26 new episodes of SpongeBob SquarePants. – Showtime will debut the final season of The Tudors in April, and they’ll follow it up with another family saga, about shipping and railroad magnate Cornelius Vanderbilt and his wealthy relatives. PS – Check out the new Tudors videogame. – NBC has announced its midseason sked, which includes a premiere date for the new season of Celebrity Apprentice: March 14. – Is this enough reason to tune in to the painfully boring 90210 remake: Gilmore Girls‘ Luke, a.k.a. Scott Patterson will guest star? Hmmmm … Pretty much any GG alum is tops in my book, but 90210 is a really lame show. – Two sad cancelations: Flight of the Conchords and On the Air with Alexa Chung. – Gossip Girl, the comic book? Uh huh, and it actually sounds kinda cool. – And tonight in primetime: It’s part one of the So You Think You Can Dance season finale at 8PM ET on Fox; The Waltons papa Ralph Waite pops in as Gibbs’ daddy on NCIS (8PM, CBS); ABC replays A Charlie Brown Christmas (8PM); Cookalong live with Gordon Ramsay: Cookalong Live (9PM, Fox), in which the grumpy chef cooks a meal, live, and invites the home audience to cook along with him (recipes and shopping list are at the show’s Website); Kelso says goodbye to Ted and Gooch on Scrubs (9PM, ABC); Linda sells a children’s cook on Better Off Ted (9:30PM, ABC); Natalie continues to be a bee-otch-y hot mess on The Bad Girls Club (10PM, Oxygen); Alicia Keys celebrates the release of her new CD with a concert on Fuse (10PM); New episode of Teen Mom on MTV (10PM); TBS debuts its annual Funniest Commercials of the Year special (10PM), hosted by Weeds star Kevin Nealon; and on The Good Wife (10PM, CBS), has Alicia run into a racist judge? – Emmy and Oscar-winning director and producer Barry Levinson thinks TV networks should program Saturday nights with must-see-TV. Saturday nights are a repeat wasteland now, but in the past, hits like The Mary Tyler Moore Show, All in the Family, The Bob Newhart Show, Hill Street Blues, Golden Girls, Love Boat, Mission: Impossible, Gilligan’s Island, The Streets of San Francisco, M*A*S*H, The Carol Burnett Show, The Jeffersons, Emergency, Kung Fu, Starsky & Hutch, Get Smart, Gunsmoke, Facts of Life and Leave It to Beaver claimed primetime real estate on Saturday nights. – An all-Madonna episode of Glee? It’s happening. – Hulk Hogan is returning to wrestling, on Spike’s TNA iMPACT. – George Lopez has lined up Ellen DeGeneres, Eva Longoria-Parker and Kobe Bryant for the Nov. 9 premiere of his TBS late-night talk show Lopez Tonight, and has also booked Larry David, Sandra Bullock, Ray Romano, Jessica Alba, Charlie Sheen, Queen Latifah, Ted Danson, Andy Garcia, Taylor Lautner, Oscar de la Hoya and Kathy Griffin. – They’re dropping like flies from the ESPN payroll these days. On the heels of the firings of Steve Phillips and his mistress from the sports net, ESPN has suspended commentator Bob Griese for making an offensive comment about Colombian NASCAR driver Juan Pablo Montoya. – Yet another reason to love Late Late Show host Craig Ferguson: When the lights went out in his studio (and all of CBS Television City) Tuesday night while he was interviewing Alicia Silverstone, he turned on a flashlight and kept right on going with the show. – ABC has ditched plans to promote its V remake with the giant red skywritten “V”s. The campaign was going to create quite a bit of pollution, as Washington Post critic Lisa de Moraes calculated, and it was feared that the giant red Vs might freak some people out, reports The Hollywood Reporter‘s James Hibberd. – The Wire and The Office star Idris Elba is developing a new legal drama, with Battlestar Galactica producer David Eick, for NBC. – TruTV’s Las Vegas Lockdown is an upcoming reality series that will follow arrestees through the Sin City county jail, including partiers who prove that what happens in Vegas, sometimes leads to the hoosegow. – Ricky Gervais on hosting the Golden Globe Awards in January: “Everyone is sitting around and drinking. I’m going to be drunk, and I’m not going to rehearse. So, it’s the perfect gig for me.” Unless they get him to host the Oscars, too, the Globes should be, far and away, the best awards show of the year. 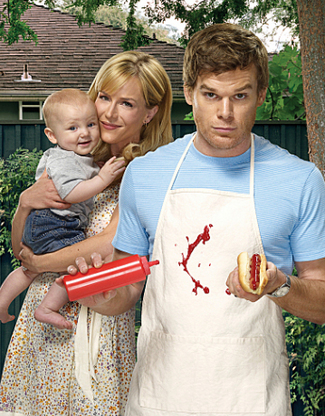 – Last Sunday’s episode of Dexter was the series’ highest-rated installment ever, with more than two million viewers. – Gabourey Sidibe, the newcomer who’s the buzz-making star of the early Oscar-fave film Precious, is in talks for a role in Showtime’s upcoming Laura Linney dark cancer-themed comedy The C Word. – Patrick Swayze‘s widow Lisa will chat with Oprah on The Big O’s Friday show. – And tonight’s must-see-TV: Barring continuing rain (it’s an icky day here in NYC), the Yankees and Phillies kick off the 105th World Series on Fox (8PM ET); Brick (a.k.a. scene-stealing kiddie actor Atticus Shaffer) is deemed “socially challenged” at school, but proves himself to be a mechanical genius at home on The Middle (8:30PM, ABC); Jay and Gloria argue about Manny’s new school outfit on Modern Family (9PM, ABC); for those with DirecTV, it’s the fourth-season premiere of Friday Night Lights (9PM); Robert has to whip up a feast at the Rock Hall of Fame in Cleveland on Dinner: Impossible (10PM, Food Network); and Adam tackles steak and blue crab in Baltimore on Man vs. Food (10PM, Travel Channel). – The Seinfeld cast reunion on Curb Your Enthusiasm is shaping up to be bigger than it was originally rumored to be. 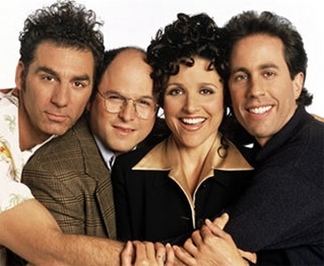 Jerry Seinfeld, Jason Alexander, Julia Louis-Dreyfus and the newly-“reformed” (according to Larry David) Michael Richards will reportedly appear in half the episodes of the upcoming season of Curb, which is scheduled to premiere this fall. – It’s a definite go: Tom Cruise and J.J. Abrams are teaming up again, to make Mission: Impossible IV for a 2011 release. – In addition to tonight’s “The Last Supper” special episode (Bravo, 9PM ET) of The Real Housewives of New Jersey, the network is stretching the show’s first season to July 9 with three more episodes, including two reunion eps and a “lost footage” installment. The so-called season finale that aired Tuesday night drew 3.5 million viewers, the highest number ever for an episode of the Housewives franchise. – Will you really make it to your destination if Homer Simpson is giving you directions? You can find out with a TomTom GPS and the company’s celebrity voice navigator feature, which now includes Homie as an option. Other TV celeb voices available from TomTom: Kim Cattrall, Mr. T, Burt Reynolds and Dennis Hopper. – T.R. Knight‘s definitely vamoosing from Grey’s Anatomy, which just makes the show even more tiresome as the off-camera dramas continue to overshadow the on-screen action. – Twin Peaks lives again, as an Internet series? It is if original series star, and current Desperate Housewives baddie Kyle McLachlan, has anything to say about it. – And, Twitter tip, the always awesome John Lithgow will play a serial killer on the new season of Dexter, and he’s Tweeting about it at @John_Lithgow.